Have you ever wondered what the difference between jam and jelly is? There is a definite distinction that sets both of these canning products apart - but there is also a great deal of similarities. The simple answer is that one contains juice and flesh from a fruit or vegetable where the other only contains the juice. However, there is a bit more to the explanation that clearly defines the difference between jam and jelly. 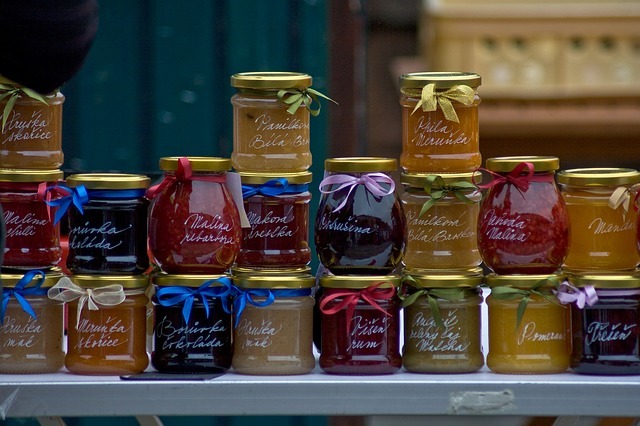 When it comes to preserving, jam is one of the most common because it uses much more of the fruit or vegetable produced into a spreadable food. Essentially a jam is a soft, firm canned item that contains a combination of the flesh and juice of the item being preserved. The term 'jam' is defined as something that is made from whole fruit that has been cut, chopped or crushed into smaller pieces. It is then heated with boiling water and sugar. The chemical reaction this creates activates the natural pectin contained in the fruit prior to being sealed in jars. Here's where the difference between jam and jelly becomes clearer. A jelly is a fruit spread that is clear or translucent and is made from the juice from sweetened fruit. The similarity to jam is that both products use naturally occurring pectin in order to set or gel. The second difference between jam and jelly comes from the final product. A jelly is not as firm as a jam as it does not contain pieces of fruit. Also, if the juice of the fruit or vegetable being used does not contain enough pectin to properly set then additional pectin may be required. The solution to this may come from combining fruit or adding store-bought pectin from a pouch. Learn more about home canning by visiting http://www.JamBusters.ca today!